Credited with starting a food revolution, the New Complete Baby & Toddler Meal Planner has become the 2nd best-selling non-fiction hardback of all time. And now, this special enhanced edition of Annabel's global bestseller is filled with brand new recipes, updated favourites and timeless classics relied on by an entire generation. From Annabel's famous chicken and apple balls, to her new superfood puree combos, each recipe is guaranteed to tempt even the fussiest of pallets. Coupled with essential advice, tips and meal planners, this is the No.1 guide for giving your baby the very best start. Plus, the 25th Anniversary Edition includes a handy pull-out weaning chart. "Her recipes prove that babies and toddlers will eat their greens - and much more - if served up in imaginative ways"
"A mother who does not have at least one of her books in her kitchen should waste no time putting that right"
Annabel Karmel: Mother of three, Annabel Karmel MBE is the UK's No.1 children's cookery author, bestselling international author, and expert on devising delicious, nutritious meals for babies children and families. 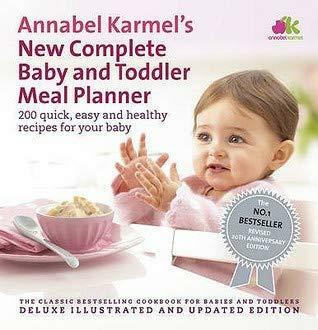 Since launching with The Complete Baby and Toddler Meal Planner more than 20 years ago, Annabel has written 42 books, which have sold over four million copies worldwide, covering every stage of a child's development. In fact, Annabel's very first book is one of the UK's bestselling nonfiction books of all time.